Beauty world through cat's eyes: JUST A BLACK PENCIL? My relationship with the classic black eye pencil has quite changed during the years. When I was much younger and not that experienced with makeup-stuff, I was convinced that it was a waste of money to invest on a high-end eye pencil product, thinking that drugstore brands were more than good. Growing up I got more and more interested in makeup techniques and realised how important it is to have a good quality black liner, so I begin buying high-end kajals as Lancome and Helena Rubenstein. 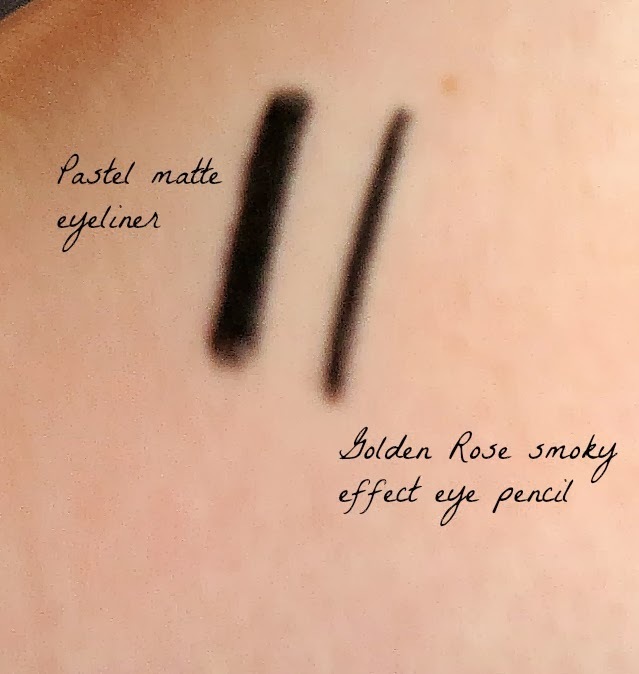 Lately, I thought it was time to try again drugstore eye pencils and I decided to give a try to two Turkish Brands: Pastel and Golden Rose. I´ve already tried once a Golden Rose product - I bought a lovely baked blush while on holiday in Antalya two years ago- so I was keen to try something else from this company. 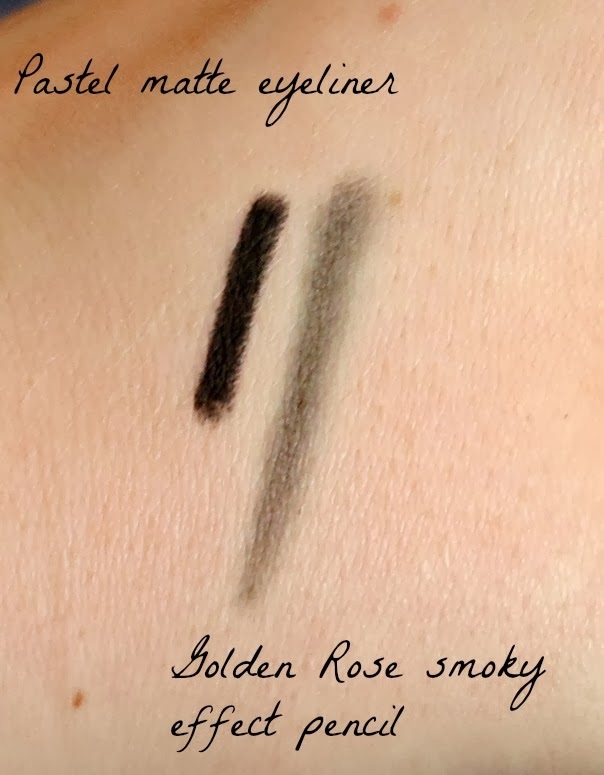 The Golden Rose Smoky Effect Eye Pencil in Deep Black is very soft and should be long lasting too - I haven´t tested yet, so I won´t promised anything here. But I was pleased to see that it comes with a sponge applicator- perfect to blend the black line for smoky eyes look. You can see the blending result in the photo below. The price is about 5,29 pounds for the british market, while in € is 4,95. I could just find out that Golden Rose products are available online in UK and Germany. I was also very curious to try Pastel products because I´ve heard great things about them. I am currently using Paste Matte Black Waterproof Eyeliner and I was really surprised by its quality. This eye pencil is so pigmented and yes, very matte. The long lasting finish on the waterline is pretty good too and it is not that mess to remove with a good makeup remover. Unfortunately, I could not find an on line Pastel shop...except for Roumania, but if I remember right I paid this eye pencil about 10/12 Turkish Lira (about 6€). Do you prefer using drugstore or high end eye pencil? What is your experience? Let me know!